One of the most 80s movie plots ever: An entrepreneur overcomes significant obstacles while starting his own business, passing up an angel seed round, albeit one that would eliminate his claim to equity, and bootstrapping the venture of his dreams via his side hustle. Orrrrr … a movie about a man who loses his wife, fights back against his father-in-law, and wins the heart of his son, all while arm wrestling his way to a trucking business. Or is it Hawks? Hawkes!? It’s LITERALLY in the same conversation that both got brought up. Lincoln, we will use his first name because it’s safe to, asks for odds on Lincoln Hawk … the oddsmaker checks in with his counterpart asking about “Lincoln Hawks” … and then the tournament board, before Meet Me Half Way ends, shows L Hawk. All he is missing is his trademark hat! Oh, and his kid! Kenny looks like he just walked off the coke fueled rager that was the Top Gun wrap party, and into the bar down the street from where Stallone was filming Over the Top. I’d like to imagine Stallone gave him a high level summary of the film, and over a few beers, Kenny, guitar in hand, pens Meet Me Half Way on the spot. The 80s could, and did, do better than Over the Top. Two years after joining Van Halen and releasing 5150, the Red Rocker jumps on the Over the Top Soundtrack with the song Winner Takes IT All. Which, if we are being honest, is a bit lacking in the poetry department. Not exactly Van Halen’s Right Now. This song probably belongs on the Karate Kid Soundtrack. 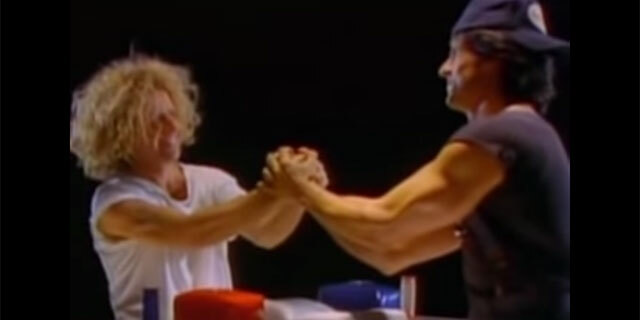 The video for Winner Takes It All is basically a retelling of the movie, only featuring Sammy Hagar. The Red Rocker is just kickin’ it in a cut up t-shirt and lounge pajama bottoms, running barefoot before shredding out the opening solo on his solid red 80s metal axe. Hagar rules! Rick Zumwalt, who plays Bull in the movie, makes a cameo, along with Sly and a ton of other wrestlers. Clearly they took plenty of footage from the film. In no world does Hagar win this one. Synth. Reverb’d drums. Guitars that float on the breeze. Robin Zander, lead singer of Cheap Trick, is fully in his element. No stranger to 80s soundtracks, Zander and the rest of Cheap Trick were featured on the Top Gun Soundtrack just one year prior with Mighty Wings. The song itself is 100% ‘Merrika lyrically. Additionally, it shares common bonds with Track 6, Loggins’ Meet Me Half Way. Apparently the international version had Eddie Money (also on the Over the Top soundtrack) sing In This Country. Probably some contractual obligations. Larry Greene’s Take It Higher is upbeat montage music. As with Robin Zander, he too appears on the Top Gun Soundtrack with Through the Fire. Perhaps he suffers from Pyromania? A song about a man, his son, his truck, and a weight training pulley to practice arm wrestling on long hauls. Lincoln Hawk was the consummate 80s family man, working 161 hour weeks, sleeping one hour a night, and telling Robert Loggia to pound sand. Frank Stallone isn’t half bad, but Hall & Oates he is not. Bad Nite has the right combo of synth, bass, horns, and wailing guitar to drink some liquor to. Lotta overdrive on that guitar tone. The ladies backing him up on the vocals really makes the tune sparkle. Kenny Loggins can do it all. From the power of Danger Zone (Top Gun), to the craft and finesse of Over the Top’s Meet Me Half Way. Guy is a total pro. Look at me, pro! 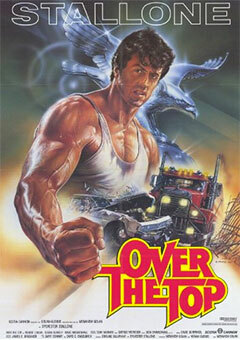 Meet Me Half Way is the Over the Top theme song. It plays in various formats throughout the entirety of the film, solo piano, acoustic guitar, full album version. One version of Meet Me Half Way starts with a light piano fading out, a few Phil Collins drum beats, and then a has a ripping intro solo. Lincoln and son Michael start their calisthenics routine at dawn, bathed in golden morning sunlight. One-armed rows off the truck grill, followed by Michael getting his sleeveless Jr. ROTC jacket make for a supreme father-son montage training scene. Hawk Trucking looks to be hauling Brut cologne. Choice. Great pop rock! Gypsy Soul relives a bit of the late 70s, only with 80s tones. The synth, the beats, the wailing guitar … what is this, The Transformers: The Movie Soundtrack? Giorgio Moroder’s The Fight does an admirable job of trying to emulate the style and grandeur of DiCola’s Rocky IV score. And for that matter, his score for The Transformers. Hey hey, Larry Greene is back! He is sonically living in Peter Gabriel’s world with Mind over Matter. Ahhh, Eddie Money. The guy exclusively names songs directly after the main line of their chorus. And so it is with I Will Be Strong. This song is pretty much a run of the mill 80s pop rock tune.